There is still time to take part in the Passports With Purpose fundraiser for Heifer International. Not only is this a great way to give back to the world but there are some excellent prizes to win. To participate select a prize and go to First Giving to make a raffle donation. For each $10 donation you make, you'll be entered into a raffle for the prize you've selected. I’m offering up a $150 gift certificate to B&H Photo in New York to be sent anywhere in the U.S. You’ll have to hurry. The deadline to take part is December 29th. One of the best parts of Travel Blogging is the community. Kudos to the four Seattle-based Travel Bloggers (Delicious Baby, Nerd’s Eye View, WanderMom and Wanderlust and Lipstick) who came up with the idea and put this together. 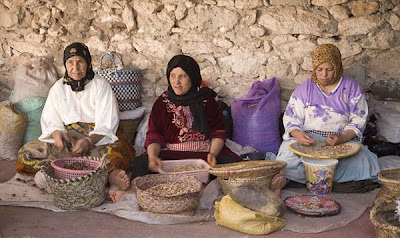 Photograph: Women’s Cooperative in Morocco for almond products. Heifer Int'l is a cool operation. Looks like the bloggers raised some nice money, too. Glad you took part in this, keep it up! Heifer does great things. The effort raised about $7,400.